Effective with the 2018 crop, seed cotton is now a covered commodity under Title I of the 2014 Farm Bill and eligible for PLC (Price Loss Coverage) payments. For purposes of the legislation, seed cotton is unginned upland cotton – a combination of both cotton (lint) and cottonseed. Seed cotton is eligible for both PLC and ARC (Agricultural Risk Coverage). This article is the second in a series (see the first article here) that briefly explain the basic workings of this new seed cotton program and focuses on the PLC option only. Reference Price and Payment. The Reference Price for seed cotton (SC) is 36.7 cents per lb. This is fixed in legislation and does not change. This is a weighted average combo price for lint and seed. A PLC payment is made if the weighted actual MYA (market year average) price is less than 36.7 cents. The MYA floor price is 25 cents. This means if the MYA is less than 25 cents, 25 is used. This effectively caps the PLC payment rate at 11.7 cents. If the MYA price is less than the 36.7 cents reference price, a PLC payment is made. Notice that since this is a combo price, the MYA will be impacted by what happens to both prices. A decrease in the MYA price for lint could be partially offset by an increase in the price of cottonseed and vice versa. What to Expect. 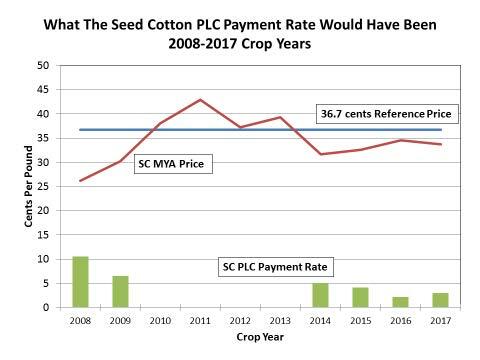 Let’s assume this seed cotton (SC) program had been in effect for the past 10 years (2008-2017 or since beginning of the 2008 farm bill). The table below shows what the MYA price for seed cotton (SC) would have been each year using the formulas just described. Upland cotton and cottonseed production for 2017 are the latest USDA projections. 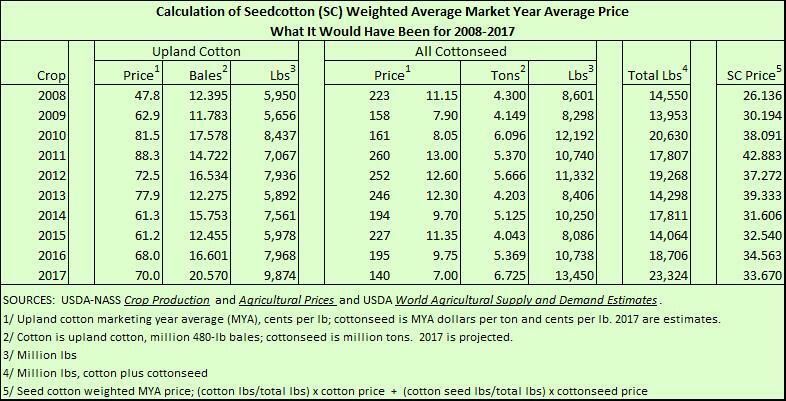 Upland cotton and cottonseed prices for 2017 are MYA estimates by the authors based on data to date. For these 10 years, the SC MYA price averaged 34.63 cents per lb. The SC MYA price would have been below the SC PLC Reference Price six out of the 10 years. Over the 10 years, including zero years, the PLC payment rate would have averaged 3.15 cents/lb per year. Base Acres. This seed cotton program applies only to farms with Generic Base (former cotton base under the 2008 Farm Bill) and that have planted cotton or a covered commodity during 2009-2016. If a farm currently has no Generic Base, none is earned under this program. If a farm has Generic Base but has planted no cotton or covered commodity in 2009-2016, the Generic Base will become unassigned base and ineligible for ARC/PLC. Any PLC payment will be made on seed cotton base acres. Landowners will be given several options to choose from to convert Generic Base to seed cotton base or a base of seed cotton and other covered commodities like peanuts, corn, soybeans, wheat, etc. This will be based on the farm’s planting history from 2009-2012. This is the same window of history used in the “retain” or “reallocate” decision for the 2014 Farm Bill. Payments are made on base acres, not acres planted. There is no requirement to plant cotton or any other covered commodity to be eligible for a seed cotton payment. Payment, if any, is made on 85% of base acres. Payment Yield. If a farm has Generic Base (former cotton base), that base also has a cotton countercyclical payment (CCP) yield already established for it under the 2008 Farm Bill. This was the yield used to make countercyclical payments under that legislation. For purposes of the seed cotton program, landowners will be given the option of keeping this current CCP yield or updating it to 90% of the average yield for 2008-2012. This is the same window of history that was given for covered commodities to update PLC payment yields for the 2014 Farm Bill. The seed cotton payment yield will be the CCP yield times 2.4. Payment Example. The following is a hypothetical example of how a seed cotton (SC) PLC payment would be calculated assuming a SC MYA price of 33.5 cents/lb. Payments Calculator. The seed cotton MYA price is a weighted price – as illustrated, dependent on upland cotton production and cottonseed production and the MYA price for both. It is a combo price. The following is a table of estimated SC PLC payments at varying combinations of lint price and cottonseed price. 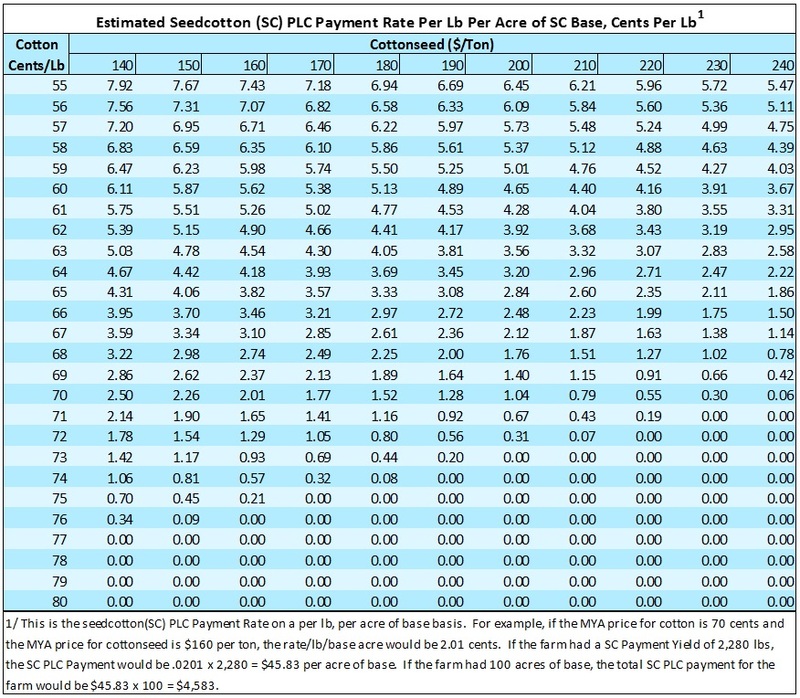 The table shows the seed cotton (SC) PLC Payment per lb of seed cotton payment yield per acre of base. This makes it easy and convenient for a producer to estimate what the SC PLC Payment would be for his/her specific situation. Payment is received on only 85% of base acres, but this has already been factored into the payments table. The payment rate of 1.52 cents allocated over all base acres would be equivalent to 1.79 cents received on 85% of base acres. Appreciation is expressed to the Georgia Cotton Commission and the Georgia Peanut Commission for funding support. Appreciation is expressed to the National Cotton Council for review.